In the most recent episode of The Presentation Podcast, episode 38 “Alternatives to PowerPoint,” my co-hosts and I talked through presentation software options other than PowerPoint. On a related note, I spent this week at The Presentation Summit conference in Florida. The conference is focused on the presentation industry as a whole, not specific software, and there are some interesting parallels from what I saw at the conference and the podcast discussion. Throughout the podcast, Nolan Haims, Sandra Johnson and I (Troy Chollar) discuss a lot of apps and when other software can be a good option. PowerPoint is the software we reference as the benchmark. Ironically, at The Presentation Summit this week, Microsoft was the only presentation software represented (they came with a team of 6 Project Managers and Developers – which is a fantastic opportunity for anyone in the presentation industry to have direct access and conversation with the people responsible for PowerPoint!). The product expo had many great companies represented: slide management, hardware, add-in coders, AR and VR (amazing stuff! ), and more. 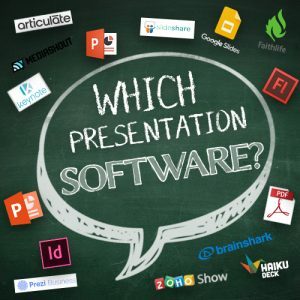 But Keynote, Prezi (who have been at the conference in the past), Haiku Deck, Adobe, Google, and other presentation creation apps did not have a presence. Another interesting parallel that I noted was that for a conference full of professional presentation designers, there was continuous excitement over discovering new features and ways to use PowerPoint. That excitement of discovery ties in directly with a new LinkedIn an article that I posted, “The ‘New’ PowerPoint” about how people do not realize features that have changed and been added, literally making PowerPoint a new software app compared to previous versions. The key takeaway is: yes, there are other presentation software options available. However, those other options do not have a large user base or large profile at presentation industry events. Microsoft’s PowerPoint continues to be the industry standard for presentation software – and there are plenty of new features to make it better than the “old” PowerPoint. The Presentation Podcast Episode #38 Released Today! The Presentation Podcast Episode #37 Released Today!